Title text: If you can't get your graphing tool to do the shading, just add some clip art of cosmologists discussing the unusual curvature of space in the area. I'm trying to imagine what would it look like when the percentage doesn't add up to 100. It seems like Randall put in his full 130% effort on this one. If the numbers don't add up to 100, say the difference is the "margin of error". A rising pie lifts all boats. I think it's like with triangles; pie charts add up to more than 100% on positively curved surfaces, exactly 100% on flat ones, and less than 100% on negatively curved surfaces. moody7277 wrote: I think it's like with triangles; pie charts add up to more than 100% on positively curved surfaces, exactly 100% on flat ones, and less than 100% on negatively curved surfaces. That was my first thought too ... graph it on a sphere if they add up to more than 100%. Hadn't considered the geometry if they add up to less than 100%, but yeah, a negatively curved surface would do it. In fact, with sufficient negative curvature you could graph any non-zero positive sum without "wrinkling" the chart out of the surface. What I'm not clear on is what the maximum sum could be on a positively curved surface. My intuition tells me it would depend the radius of the sphere. 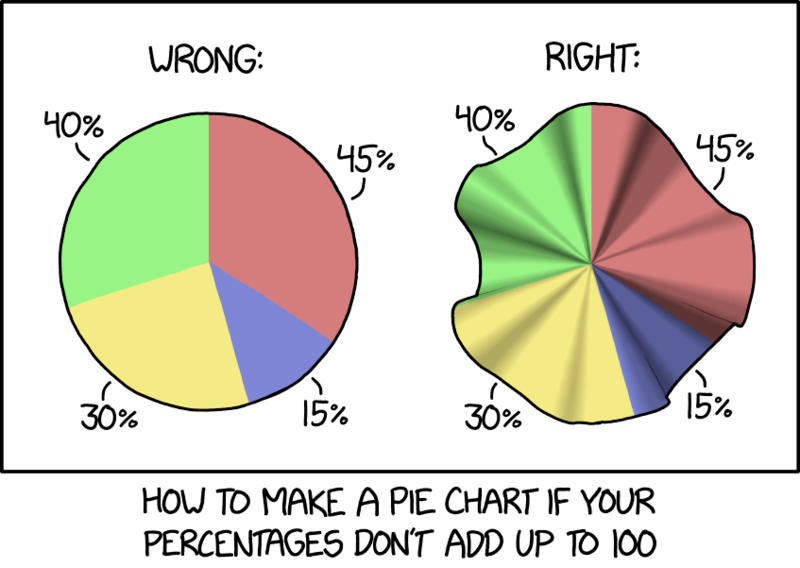 Like, if the chart spanned an entire hemisphere, you could do a pie chart with percentages that sum to 2πR, no? It gets kinda fuzzy if you go past one hemisphere. There probably some topology theorem that answers this question, but I try to avoid that branch of math. Heimhenge wrote: That was my first thought too ... graph it on a sphere if they add up to more less than 100%. FTFY Sum of internal boundary angles add up to>180° (or pi rads), but length of boundary (tending to circumference) is shorter than the 2.pi.r of a flat plan and areas likewise lower (whichever is the surrogate to percentage). Each centre-point still has a full 360° around it, but have only five 60°-worth elements and insist on making them adjoin around, you're starting to construct a dodecahedral corner. The other curvature handles more, 'rucking up' as per the comic, until you stretch it out into a hyperbolic plane of some kind. What's This Foolishness? Reca!culate the percentages. I always knew Randall could get hyperbolic at times, but this is getting ridiculous. Other way around. Negatively curved surfaces grow faster, positively curved surfaces grow slower. I am just in awe at the beauty of the shadings in the right graph. Now that you mention it, yeah I guess it depends on what geometric entity represents percentage. I was thinking "area" since circumference arc lengths and vertex angles would be meaningless. There might be some other measure that works ... maybe sum of the interior angles, or something like the Gaussian curvature. But I think area is the most intuitive, since on a normal flat pie chart area maps to percentage. The area of a circle sector (the area bounded by two radii and a suitable perimeter arc between them) on flat space is proportional to the arc-length (is proportional to the angle between the two radii at the centre). You'd not be wrong in perceiving either area or thickness of angle as reflecting the relative values of two 'slices' (unless it's a deliberately information-added variable radius version, of course). On a spherical surface, the centre-angles will technically all give "100%", still (for an arbitrarily small area of surface around the centre, still bounding the point, the surface tends towards flatness) but there's less area for a circle of any non-zero 'radius' (maxes out at 4.pi.R² when r of the circle approaches pi.R on the radius=R sphere and becomes the whole sphere, from antipode to antipode) and less perimiter too (maxes out at pi.R² when describing a hemisphere limit at r=½.pi.R, then falls back to zero at pi.R). Like arc and chord lengths, it starts out roughly similar until the spherical geometry starts to be 'felt', then, past the point of the 'fattest waist' it goes radically different. For all practical purposes, though, percentages that don't add up to 100% are likely represented by either <2.pi.r of circumference or <pi.r² of area in equal measure of summed sectors, and those should lay down on a sphere if you're determined to make the sum of the 'pointy angles' add up to a full circle, rather than a Pac-Man. If your chart generates more confusion than clarity, consider including some sort of label. "上下文很重要." is true, and relevant. However a viewer expecting English on this board would probably rather I type out "Context is very important." A chart showing a percent of some unindicated amount, rather than any of the indicated amounts, makes the same mistake. "Percent Profit on School Fundraising by Vendor"
"Percent Profit on School Fundraising by Event"
"Percent Profit on School Fundraising by Grade"
"Percent Profit on School Fundraising by Year"
are of the wrong sort. give an inappropriate number of data. It doesn't matter. The area of a circle on the surface of a sphere is also less than its flat counterpart. Area applies more to absolute values, while the angles indicate the fractions of the total. This is apparent when you consider a big slice of a small pie and a small slice of a big pie in the same presentation. In this case, the angles are still normal fractions of the total (15/130 for example), and the area of the implied 3d surface is 130 units. The area of the 2d projection should be 100 units, but isn't quite right in the example due to the hand-drawn nature and the comic exaggeration. For OCD health and safety reasons, the shading should be changed to be symmetrical and smooth as like a deployed parachute rather than a rumpled sheet. It has to come to a point in the middle to be able to consistently represent the required quantities, though. If it were smooth, then the represented fractions would vary with the radius of the pie (relative to the radius of curvature). The shape in the comic is actually flat (as in Euclidean) except for at the one point of discontinuity in the center. It's basically a cone, but with extra surface around it instead of missing surface.